The number one thing to bring on any trip is a positive attitude. You laugh, but when the heat rolls in, the kids are cranky, and the lines are long, it can be hard to find that smile. Keep telling yourself, “We’re here to have fun.” Do you really need to ride every attraction at the theme park? If you’re not having fun, are you really getting your money’s worth? 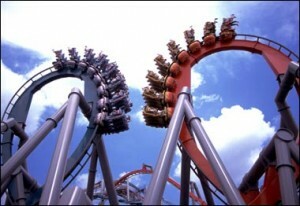 When going to a theme park, I find that it helps to have a loose itinerary for each day. We plan a couple of must-do’s for each of us before we leave. Then, everyone has a couple of want-to’s that we try to fit in once we’re there. Another biggie: keep meals and sleep times as normal as possible. Bring along some healthy snacks like cereal and dried fruit. Freezing juice boxes works well on really hot outings. My toddler likes to drink them while they’re still a little slushy. Of course, bring plenty of water. If you’re an umbrella stroller fan, bring it. I’m not, so I bring our regular stroller. I like the cup holder/snack tray for parent and child, and the roomy storage underneath. Mine is light and folds pretty easily. I’ve never had any trouble bringing it on trams or monorails, etc, where it needs to be collapsed. As an added bonus, I like how sturdy it is so we can use it as a luggage cart at the airport and hotel.